Push yourself further with the Backbeat FIT Boost Edition, featuring premium wireless sport headphones, a water-resistant charging pouch and unlimited access to 12 workouts on the PEAR Personal Coach App. * Enjoy a 6-month PEAR+ Membership, including interactive audio coaching from world-renowned trainers and athletes - whenever and wherever you want. Flexible, durable and waterproof, the headphones stay put through your toughest workout sessions, while PEAR works hard to keep you motivated. * Subject to PEAR Sports terms and requirements. PORTABLE POWER: Sport headphones are IPX5-rated water-resistant and include a quick-drying charging pouch for up to 10 additional hours of listening time, plus easy stowing and ventilation for sweaty headphones. INTERACTIVE AUDIO COACHING AND WORKOUTS: Stay motivated with unlimited access to 12 workouts on the PEAR Personal Coach App* and a 6-month Membership to PEAR, with interactive audio coaching from world-renowned trainers and athletes. * Subject to PEAR Sports terms and requirements. STABLE AND COMFORTABLE: Long-lasting stability and comfort for every workout level, BackBeat FIT Boost headphones feature a behind-the-ear design and soft, flexible neckband. Hear your music and your surroundings with the open eartip design, and enjoy nighttime visibility with the reflective finish. 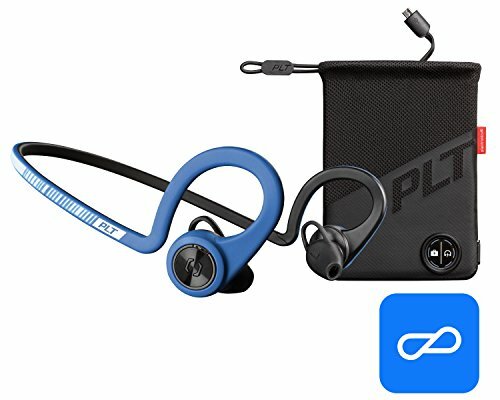 SWEATPROOF AND WATERPROOF: Wireless earphones are durable enough to withstand your most intense workouts with a waterproof design that meets the IP57 rating plus sweatproof nano-coating. LONG LASTING BATTERY: Power an entire week of workouts with up to eight hours of listening from a single charge, or get through an express training session with a 15-minute quick charge for a full hour of listening.